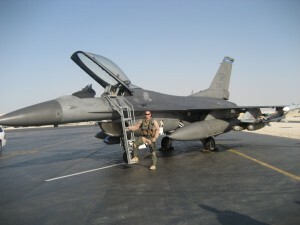 The following article is by recent grad Dave Shotsberger. He has a good friend who is literally a legend in Florida sprint car racing and pens a newsletter called the “MONTHLY MULLET WRAPPER” that goes out to most of the sprint car community, not only here but around the country too. Dave was asked to do a little write up on the school for the July/August MMW. Mulleteer, friend, sprint car driver, and fellow pilot recently went to the Frank Hawley Drag Racing School to qualify to drive straight liners. I asked Dave to pen a short article describing the experience and furnish photos chronicling the events. Read and enjoy. Hmmmmmm…… As a young boy I was fascinated by drag racing, playing with my Hot Wheels cars and reading every racing magazine I could convince my parents to buy. I would pester my Dad to take me to the little podunk strip in our area to watch the local guys. But with Williams Grove 5 miles away and the lure of sprint car racing I soon left drag racing behind. 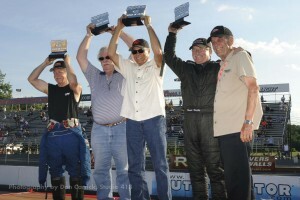 There is a significant amount of drag racing activity in the Southeast. So why not try it? And what better way to “try before you buy” than going to a school? 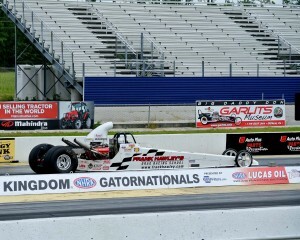 So we decided I would attend Frank Hawley’s Drag Racing School in Gainesville and see how that worked out. If it went well and the interest was still there we would consider the next step. I’m sure most people in our area have been to Gainesville. If not then you may not know that we have a world class facility right here in our area. Gainesville is also one of the longest tracks on the national circuit which is perfect for students. Frank Hawley’s school has been in business for many years. I have heard of it but never realized the quality of the programs that they offer. And let me say right here this is a real school with real training not some hokey “experience”. Frank is the teacher. 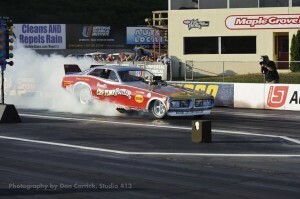 In addition to his broad background in this facet of the sport he is also a two time national Funny Car title holder. 12. Inch forward. Stop when stage bulbs light. 16. When instructor activates the Christmas tree, release the transbrake button. HOLD ON A MINUTE!!!! The first time I do this I’m going to launch at full throttle??? And that was correct. So on the first day we had about 2 hours of classroom and in car orientation and then start the car, burnout stage and launch. The class includes 6 runs. 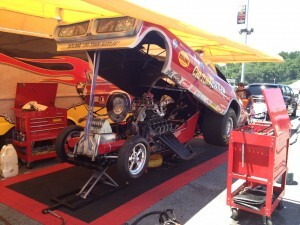 NHRA requires 6 time slips and two full runs for a license. Your first pass is 200 feet and if successful then followed by 600, 1000 and then full runs. To say I was startled by the launch is an understatement. 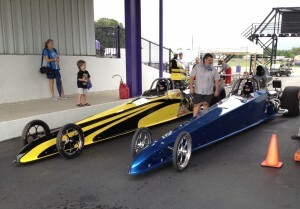 The cars are Super Comp dragsters weighing 1550 lbs. with 720 HP. Not too far off of a sprint car. But the grip on a prepped track allowed no wheel spin and when you let go of that transbrake button it’s like a rocket launch. I don’t know how people drive those fuel cars. I made the 200 foot run successfully and was in the car to do the 600. And then the rain came. It did not stop raining for the rest of the class. The bad news is we had to come back later and finish the runs. The good news is we had an abundance of classroom time. The classroom time in this course is fascinating. Because of the rain Frank had plenty of time for stories from personal experience that we may not have heard so I feel like I got a big bonus. While the course is about drag racing and reaction time it goes far deeper into the psychology and physiology of being a successful racer. Or for that matter successful at anything that requires focus. The classroom work was every bit as interesting as the car part. On July 10 we went back (Linda was able to come along this time) for 1 day to finish all of the runs. It was a lovely hot, humid Florida day to be walking around on asphalt in a driving suit. Having had two months to think about that first “launch” I was much more prepared this time around. We successfully progressed through the 200, 600 and 1000 foot runs so we got to do 3 full passes. The cars are a joy to drive. By the time we go to do the full passes I was very comfortable. The hardest thing for me to get used to was the launch but after just a few it wasn’t a factor any more. Linda fulfilled her duties as a freelance photog for the Penguin Television Network. With all the runs being good my NHRA application was signed off by Frank and we now hold a NHRA Class 4A competition license (ET 7.50 to 9.99 wheelbase 125” and up) number 2257. I can’t say enough about what a great experience this school is. The cars, classroom and instruction are all top notch. 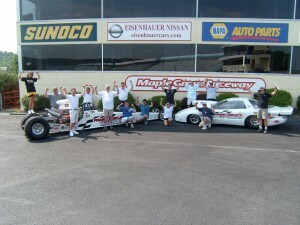 The staff are all courteous and professional and all have years of racing experience. If you even have a passing interest in drag racing or hot rods it is well worth going even if you never get the license or intend to race. Go to www.frankhawley.com for a look. They have all kinds of programs and pricing available. We’re not sure where we go from here. We may get a car and start running or keep watching for a while. Either way the school was well worth the time.